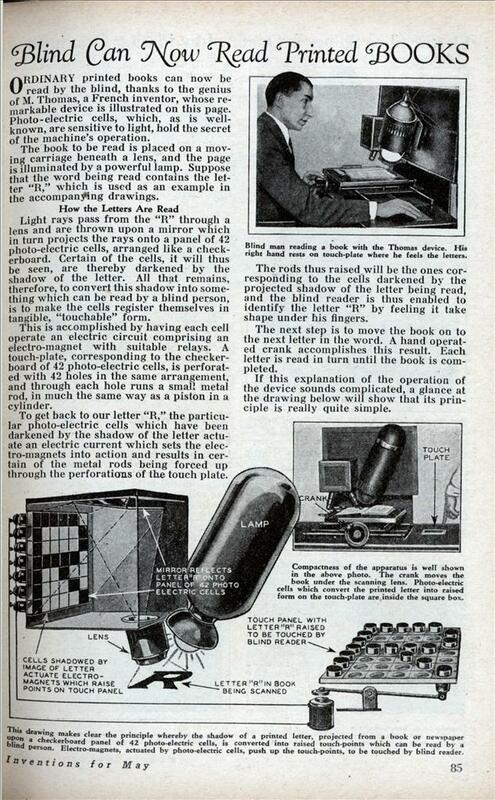 ORDINARY printed books can now be read by the blind, thanks to the genius of M. Thomas, a French inventor, whose remarkable device is illustrated on this page, photo-electric cells, which, as is well-known, are sensitive to light, hold the secret of the machine’s operation. The book to be read is placed on a moving carriage beneath a lens, and the page is illuminated by a powerful lamp. Suppose that the word being read contains the letter “R,” which is used as an example in the accompanying drawings. Light rays pass from the “R” through a lens and are thrown upon a mirror which in turn projects the rays onto a panel of 42 photo-electric cells, arranged like a checkerboard. Certain of the cells, it will thus be seen, are thereby darkened by the shadow of the letter. All that remains, therefore, to convert this shadow into something which can be read by a blind person, is to make the cells register themselves in tangible, “touchable” form. This is accomplished by having each cell operate an electric circuit comprising an electro-magnet with suitable relays. A touch-plate, corresponding to the checkerboard of 42 photo-electric cells, is perforated with 42 holes in the same arrangement, and through each hole runs a small metal rod, in much the same way as a piston in a cylinder. 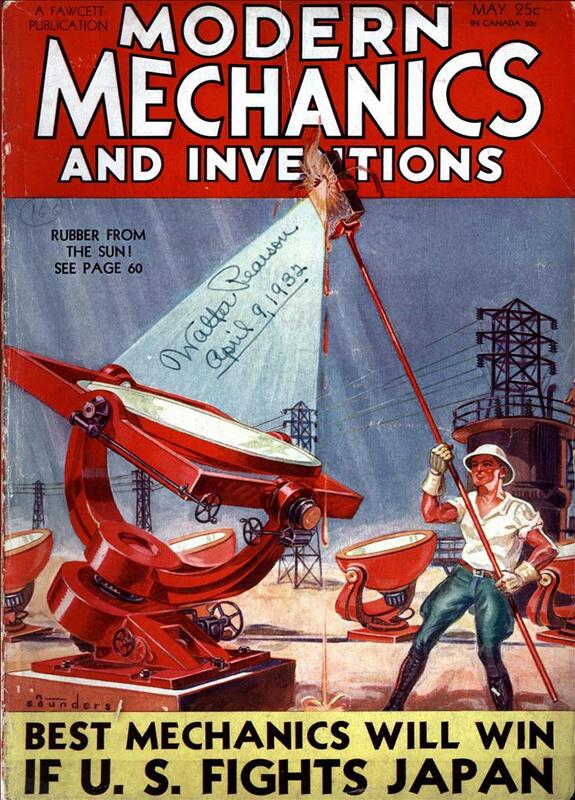 To get back to our letter “R,” the particular photo-electric cells which have been darkened by the shadow of the letter actuate an electric current which sets the electro-magnets into action and results in certain of the metal rods being forced up through the perforations of the touch plate. The rods thus raised will be the ones corresponding to the cells darkened by the projected shadow of the letter being read, and the blind reader is thus enabled to identify the letter “R” by feeling it take shape under his fingers. The next step is to move the book on to the next letter in the word. A hand operated crank accomplishes this result. Each letter is read in turn until the book is completed. If this explanation of the operation of the device sounds complicated, a glance at the drawing below will show that its principle is really quite simple. Ugh, the blind person spells the words, not reads them. How would that be done today? There are still video magnifiers being made – the TVi for example. It’s about $500 plus a tv, but that’s about $35 in 1932 dollars.